Custom Machinery | Mac Machine & Metal Works, Inc. Since our founding in 1951, Mac Machine and Metal Works, Inc. has been a respected partner in the manufacturing industry. We are proudly known throughout the nation for our innovative custom machinery, fixtures, stamping dies, and replacement parts. Our commitment to quality has even enabled us to be one of the first companies in the Midwest to become registered to the ISO 9001:2008 standard. 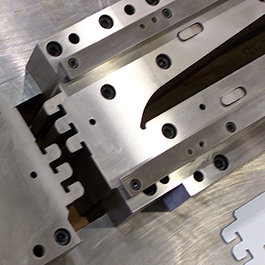 Have your metal stamped exactly the way you need on specialized, top-of-the-line equipment. Our design team is waiting to adapt your machines so they work better for you and your team. Using reverse engineering and state-of-the-art technology, creating lifelong tools accurately is simple. Enhance your application operations with custom-made parts and equipment. Mission Statement: Quality is our top priority. Sheffield Cordax® RS-50 Coordinate Measuring and Reverse Engineering System. Received Lieutenant Governor's Outstanding Indiana Business Award. Received State of Indiana Quality Improvement Award. Operates three manufacturing sites with abundant production and warehouse capacity. About Mac Machine & Metal Works, Inc.
Mac Machine & Metal Works has over 60 years of experience working alongside a number of industrial and engineering companies not only in the US, but in Mexico and the US Territory of Puerto Rico as well. As skilled and knowledgeable commodity managers, we have an extensive background in all aspects of this field, and are continually striving to produce the products you need. To further serve our customers, Mac Machine can be electronically synchronized to your parts inventory system for the restoration of your consumable tools. Our large warehouse allows us to handle tool and part storage adequately, as well as test new machines before they are shipped to ensure their safety and quality before they reach your plant. Whether you are in need of tailored metalworking or searching for that hard-to-find replacement part, Mac Machine & Metal can make this process stress-free for you and your business. Monday – Friday, 6:30 a.m. – 4:00 p.m.
Mac Machine & Metal Works, Inc.